Victories have been few and far between for the Yankees of late, so needing a full day to polish off a win seems strangely appropriate. 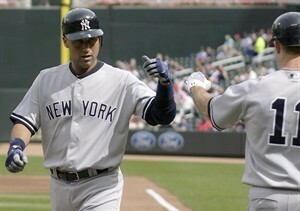 Derek Jeter receives congratulations from Brett Gardner after hitting a homerun in the sixth inning. Jeter's HR provided the margin of victory in a 1-0 win (Photo: The Canadian Press). After playing five scoreless innings on Tuesday night, Derek Jeter belted a deep blast over the centerfield field wall to give the Yankees an immediate 1-0 lead upon resumption of the game. Then, in the bottom of the inning, Jeter’s defense helped preserve the lead when he fielded a ground ball deep in the hole and used his patented jump throw to nab Delmon Young with runners on second and third. Aside from Jeter, the Yankee bullpen also played a major role in the game. David Robertson not only recorded 1 2/3 innings of shutout ball, but also endured a Joe Mauer line drive off his back that richoted into the glove of Alex Rodriguez for an out. With two outs in the seventh, Robertson eventually gave way to Joba Chamberlain, who also navigated the middle of the Twins lineup in the eighth. The highlight of that inning was a high fastball that Joba blew by Justin Morneau for a strikeout. In the ninth inning, Mariano Rivera was able to close out the victory for AJ Burnett, who pulled off the rare feat of getting a win on a day in which he didn’t pitch. It wasn’t easy for Mo, however. For the fourth straight outing, Rivera seemed to struggle with his command, and even lowered his head after letting go of a 3-2 cutter that hung in the zone to JJ Hardy. Off the bat, it looked as if Hardy had tied the game, but the ballpark held the blast and Kevin Russo ran it down for an out. Rivera then walked Thome, as he had done in his last blown save, but rebounded to induce a double play from Denard Span. The strong outings by Robertson and Chamberlain were particularly important to see because the Yankees may be without jack-of-all-trades Alfredo Aceves for an extended period of time. Even if both pitchers round into form, however, the Yankees will still need Mariano to regain his form if they are going to defend their championship. In addition, the Yankees need bats like Teixeira, Cano and Swisher to awaken because the Yankees pitchers have been showing signs of cracking under the relative lack of support. The Yankees send Andy Pettitte to the mound in the “second” game of the day, but probably can’t expect to win another low scoring affair. They will not only need Pettitte to give them length, especially with Robertson likely unavailable for the evening, but the lineup needs to take advantage of its scoring opportunities and jump out to an early lead.